"We had better design and build thoughtfully, sensitively, creatively, as we usher men and women into the presence of the natural gods..."
The Blue Ridge Parkway truly brings us into the presence of the natural gods in a way that is increasingly rare. Travel on the Parkway forces us to slow down and examine a sublime nature, allowing us to drop our day-to-day cares and experience the glory around us that can appear as an unspoiled pastoral nature where cows munch bucolically near the road or as a ferocious assault from a sudden thunderstorm on a high wind-swept peak when the world disappears completely from view. Don't even think about getting on the Parkway if you're in a hurry. Although it's stated purpose was to provide a link between Shenandoah National Park in Virginia and the Great Smoky Mountains National Park in NC/TN, this is not one of those routes where the shortest distance between two points is a straight line. Sure, it looks like the shortest route on the map, but when you factor in the ups and downs and around and arounds, it gets considerably longer. You'll also find yourself stopping a lot along the way - even if you didn't think you would. It has been said that you can't plan spontaneity, but you can leave room for it to happen. The planners of the Parkway definitely left room for spontaneity and this is a tourist road not a thoroughfare. But I digress. You probably want a few facts. The Blue Ridge Parkway is 469 miles long - 217 miles in Virginia, including the Skyline Drive, and 252 miles in North Carolina. It was conceived during the Great Depression -though the idea had some germination earlier - as a scenic tourist link between the two National Parks, previously mentioned. It was implemented out of a need to put people to work in 1935 during the Depression and the Civilian Conservation Corp (CCC) provided the labor. The Blue Ridge Parkway history is full of colorful characters (though all the old pictures are black and white) and hard working, determined, supporters. The road was not easily built, nor was the route easily determined. The route through Virginia was fairly easily established, but a rather bitter rivalry developed between North Carolina and Tennessee for the rest of the route, as both states recognized the economic benefits that would arise in the near and far term. The man responsible for finally determining the route was Interior Secretary Harold Ickes, who chose a North Carolina route because there were already two National Forests (Pisgah and Nantahala) in NC that could be used as a corridor for the Parkway, because North Carolina was regarded as more scenic and because Tennessee had already benefited from New Deal projects like the TVA. Now, if you were to think about planning a road today, you would probably call an engineer first. That's not what happened with the Parkway - they called a Landscape Architect. There were actually quite a few architects and engineers involved, but the lead architect for most of the project was the young Stanley Abbott, a Cornell University graduate. Abbott was influenced by the likes of Frederick Law Olmstead, designer of Central Park in New York and the surroundings of the Biltmore House in Asheville, NC. He wanted to create a park-like environment that would blend in with the natural surroundings and showcase not only panoramic views of the mountains, but also agricultural settings, streams and forests, and as it turned out, local folkways. Planning and landscape design for the Parkway began Dec. 26, 1933 and construction began in Sept. 1935. The Civilian Conservation Corp began work on several sections of the Parkway simultaneously, with sections being given priority where employment needs were greatest. Contractors were mandated to hire local people whenever possible. Four CCC camps were established at various points along the route to perform the work. The CCC camps were managed in military style with workers being housed in barracks, marched in formation and taking turns with kitchen duties. Almost all of the work on the Parkway, including the rigorous chore of tunnel digging, was done by hand and with very little machinery. Work continued steadily until the start of WW II by which time approximately 2/3 of the Parkway was complete. In 1942, the CCC was closed out and work on the remaining sections of the Parkway was sporadic. The work was not completely finished until 1987 when the Linn Cove Viaduct was completed. Construction of hard structures along the route did utilize modern materials like concrete for bridges, tunnels, dams, and various buildings. Stonemasons later finished the work with facings of local stone to blend the structures into their surroundings and give the illusion that the work was done in a more primitive fashion. The Linn Cove Viaduct section of the Parkway has been called the "most complicated segmental bridge ever built". The Viaduct was designed by computer and probably could not have been done earlier in the project as it required technology to be developed for its' design. It is an elaborate double-S curve elevated bridge that skirts the side of Grandfather Mountain at MP 304. The purpose of elevating the roadway rather than blasting it into the side of the mountain was to limit the impact on ecologically sensitive Grandfather Mountain, which is designated by UNESCO as an International Biosphere Reserve. The stone masons of the Parkway were some of the most talented in the world. The quality of their work is admired by millions of visitors each year. Make no mistake about it - the Blue Ridge Parkway is a masterpiece of design. While the Parkway today lives up to the ideal of providing a pastoral route through an apparently pristine environment, it is actually more of a museum piece showcasing a simpler time that never really existed in quite that way. Very little of the route was actually pristine nature. When construction began, much of the landscape had been devastated by clear-cut logging operations, streams were fouled and commercialization was already taking over the few scenic areas. 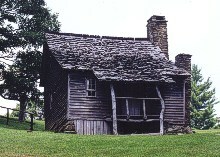 Most of the original pioneer cabins in the area had crumbled into decay or been replaced by more modern structures, so in several cases cabins from other locations were moved to the Parkway. Some of the farms along the Parkway were encouraged to remain and work with the Park Service to preserve the proper atmosphere by, for instance, maintaining traditional split rail fencing and keeping heavy farm equipment out of sight. It is still a work in progress. Today supporters of the Parkway fight to limit development along the route to preserve vistas as well as being conscious of environmental issues like smog and acid rain that affect the health of the ecosystems. "Celebrating 60 Years of the Blue Ridge Parkway - A Most Visionary Thing"
"A Landscape of the New Deal, the Blue Ridge Parkway"
"Blue Ridge Parkway - A Source of Excitement in Region for a Decade"